In a way, it feels like we've been here a lot longer than 2 1/2 weeks. Maybe because we're still living among the boxes and it feels like it's taking forever to unpack. But I finally have a desk, which gives me a lot more freedom to write to my blog. We're close to being fully unpacked. Maybe just 15 boxes or so but still lots of hooking up and wiring. It's interesting that I spent so much more time packing and Jimmy's spending most of the time unpacking. His unpacking duties involve a lot of computers that have to be hooked up and oh so very many wires that he's trying not to get all tangled up behind our desks and the tv. Oh the tv. Television has become an interesting adventure for us. We're gonna try to go without cable and watch all our shows either on Hulu or other online sources. There will be some shows we'll have to pay for, but as long as our monthly expenses are less than what we would spend for cable, then we're good to go. And if it's more, then we'll go back to regular cable. Jimmy has a computer hooked up to the big tv, so we're not limited to watching on computer monitors. Not sure if it'll work, but I'm willing to try it for a while. As long as I can watch Glee, I'm a happy camper. lol! We're doing a lot of walking. It's fantastic and we can already feel the benefits. We're not nearly as winded and can walk longer distances. We'd love for the weight to start melting off! Trouble is there are a lot of great restaurants nearby, too. I'm hoping and planning that when Jimmy starts his new job next week, I'll get into a routine of cooking more. Living out of boxes isn't conducive to cooking meals. Especially when there are so many interesting restaurants to try. We've already had our 1st overnight guest! Jimmy's sister was in town for a big conference. Thankfully, she didn't judge us for the mess. We tried to set her up on the couch where boxes wouldn't topple down upon her. Hopefully the next time she, or other overnight guests come, we'll have an actual decent aerobed set up in the 2nd bedroom. There's a Starbucks right across the street. Believe it or not, I haven't gone to it yet. I'm holding out. I know that once I start going, it'll become a regular routine. There's also Tully's Coffee across the other street, and I like Tully's more than Starbucks, but I'm playing the same mind game with it. In fact, I've only had coffee once in the 2 1/2 weeks we've lived here. Oops, that's a lie. 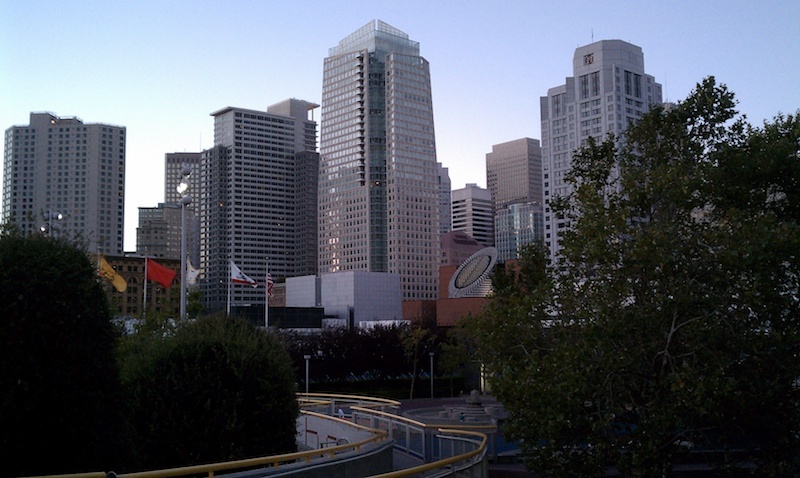 In addition to coffee with my SIL, I had a latte with breakfast last Saturday at the Museum of Modern Art. Does that sound weird to anyone else besides me?? Having breakfast at the Museum of Modern Art?? A treat that cannot become a habit, but Jimmy was out of town for the night and I required a splurge. 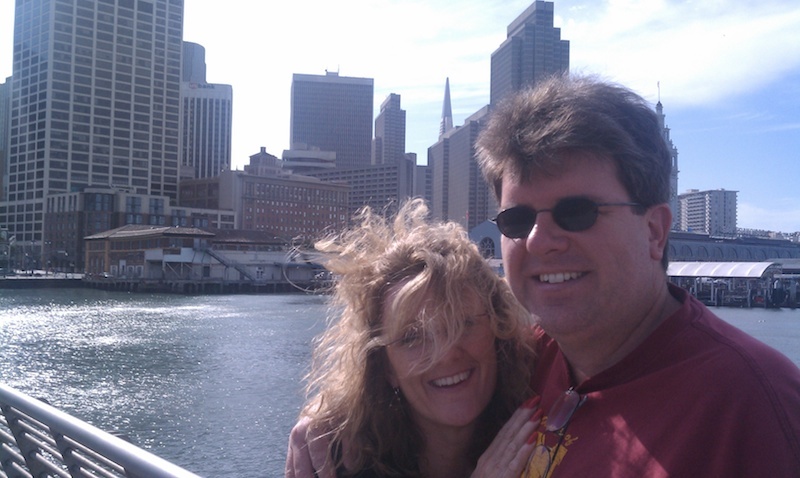 After our very last day cleaning out the duplex in San Jose, I felt no more sorrow about leaving the south bay. My sentimentality was put away in a box with the memories that we made while we lived there. But driving away that last day, it felt right going HOME to San Francisco. And while I'm not entirely convinced that I believe in "signs" per se, but perhaps we're given little hints that we're on the right path. Or even hints that we're on the wrong path. Some of you know that "grace" is my "word". I talk about it often here. 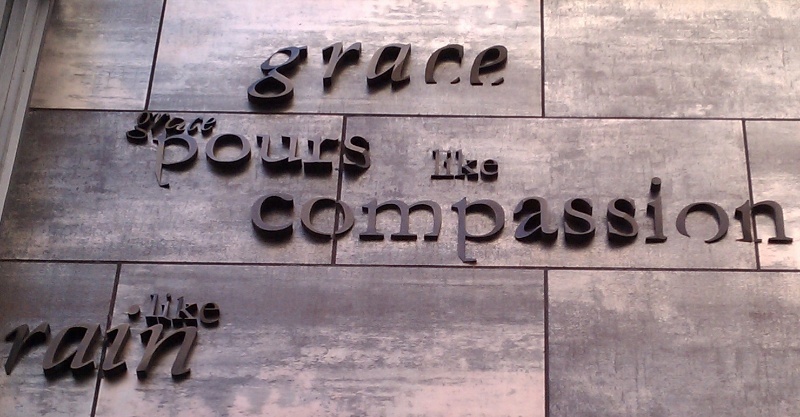 3 days after we moved, we walked by a building that had these awesome grace quotes on it. 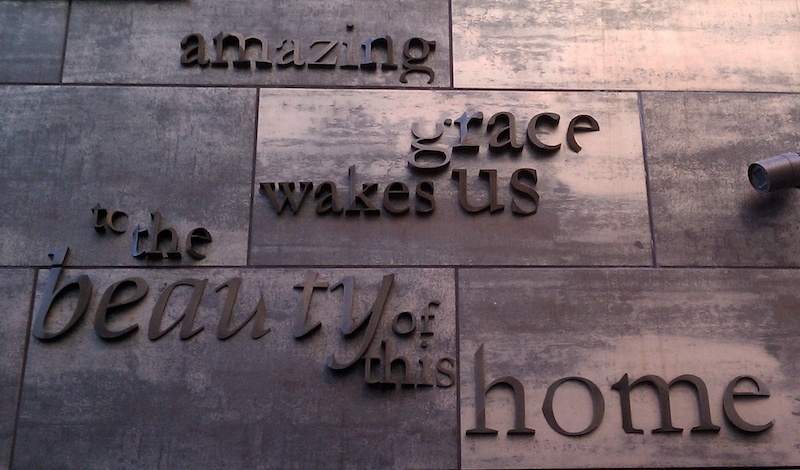 My favorite is the 1st photo above "amazing grace wakes us to the beauty of this home". How cool is that?? And if that isn't a big hint...ok ok...SIGN...that we're on the right path, I'm not sure what is. Good to see you have a bit more time for blogging, I've been off the blogging scene for a week or so too. Have been house hunting, made an offer on a house but then found out after a house inspection that there were too many things that would have to be fixed so now i am homeless again and I'm getting concerned about it. AAARRRGGGHHHH!!! Love those wall words.... they fit you just right!